To Cite: Tavakolpour S, Alavian S M, Sali S. Manipulation of Regulatory Cells’ Responses to Treatments for Chronic Hepatitis B Virus Infection, Hepat Mon. Online ahead of Print ; 16(6):e58751. doi: 10.5812/hepatmon.37927. Background: Identification of effective treatments in hepatitis B virus (HBV) infection remains a controversial topic. Although the currently approved drugs for HBV control the disease’s progression and also limit associated outcomes, these drugs may not fully eradicate HBV infection. In addition to better managing patients with chronic hepatitis B (CHB) infection, the induction of seroclearance by these drugs has been a commonly discussed topic in recent years. Objectives: In this study, we focused on treating CHB infection via the manipulation of T cells’ responses to identify possible approaches to cure CHB. Materials and Methods: All studies relevant to the role of cellular and humoral responses in HBV infection (especially regulatory cells) were investigated via a systematic search of different databases, including PubMed, Scopus, and Google Scholar. Considering extracted data and also our unpublished data regarding the association between regulatory cytokines and CHB, we introduced a novel approach for the induction of seroclearance. Results: Considering the increased levels of regulatory cytokines and also regulatory T cells (Tregs) during CHB, it seems that these cells are deeply involved in CHB infection. The inhibition of regulatory T cells may reverse the dysfunction of effector T cells in patients with CHB infection. In order to inhibit Tregs’ responses, different types of approaches could be employed to restore the impaired function of effector T cells. The blockade of IL-10, IL-35, CTLA-4, PD-1, and TIM-3 were discussed throughout this study. Regardless of the efficacy of these methods, CHB patients may experience serious liver injuries due to the cytotoxic action of CD8+ T cells. Antiviral therapy and a decrease in HBV DNA to undetectable levels could also significantly reduce the risk of the hepatitis B flare. Conclusions: The inhibition of Tregs is a novel therapeutic approach to cure chronically HBV infected patients. However, further studies are needed to investigate the safety and efficacy of this approach. Hepatitis B virus (HBV) infection is considered a major global public health challenge; 2 billion people are infected with HBV worldwide, and 240 million suffer from chronic hepatitis B (CHB) infection. It is generally accepted that contact during infancy and childhood is associated with a higher risk of chronicity compared to those who contract HBV in adulthood. Although HBV vaccination has caused a significant decrease in this disease, there is still a serious concern about the CHB patients, especially in endemic regions. Currently, various drugs that have been approved by the United States (US) food and drug administration (FDA) are used to control viral replication in HBV patients (1). However, regardless of their efficacy, these drugs do not directly lead to seroclearance. Additionally, their long-term usage may be associated with several barriers, such as a cost burden and drug resistance (2). Therefore, it is essential to think about possible approaches to induce seroclearance in CHB patients. The exact mechanism of the chronicity of HBV is not clear. However, immune responses that take place early in the infection are intimately involved in the development of CHB. In acute HBV, effector cells (especially CD8+ T cells) make a greater contribution than regulatory cells to eradicating the hepatitis B surface antigen (HBsAg) (3, 4). Dysfunction of these cells has been reported in chronic HBV infected patients. In fact, inhibition of effector cell function by regulatory cells during CHB could be one reason for the development of CHB. Considering the possible mechanisms of chronicity in HBV infection, some strategies for eradicating HBV could be suggested. In recent years, various studies have proposed therapeutic strategies for curing CHB patients (5-8). The outcomes of several diseases, including cancer, autoimmune diseases, and infections, are governed by immune response. The recognition of different types of involved cells and their associated immune system functions could aid in the development of novel therapeutic approaches. Typically, the identification of a suitable target is the first step. Subsequently, different biological agents could be employed to inhibit the target or blockade any associated responses. For example, recently the recognition of interleukin (IL)-4 and IL-21 in pemphigus has led to the emergence of new approaches to treat that disease (9-11). In HBV infection, multiple cells, including CD4+ T cells, CD8+ T cells and B cells, are deeply involved. Naïve T cells could be differentiated into different T cell subsets depending on the specific cytokines present in the microenvironment and molecules on the cells’ surface. For example, Jiang et al. (12) demonstrated that the ratio of T helper (Th)1/Th2 cells is decreased in CHB patients. Interestingly, this ratio is reversed after treatment, which highlights the critical roles of these cells in controlling viral replication and clinical outcomes. Moreover, several studies have focused on the role of regulatory T cells (Tregs) in different types of diseases. Considering the significant changes in Treg populations during HBV infection, these cells may play a critical role in controlling the disease progression. Thus, manipulation of immune responses may lead to better management of patients with HBV and could even cause the disappearance of the hepatitis B surface antigen (HBsAg) in CHB patients. Recently, it was hypothesized that Tregs, which block effective immune responses against HBV, could be inhibited to effectively cure the CHB infection (13). However, the study did not explore different available approaches to inhibit Tregs or management of weakened regulatory response patients, and any potential side effects were not discussed in detail. In this study, all these subjects were discussed in a great detail. A systematic search of several databases was initiated to consider the latest findings on the roles of different types of immune cells, cytokines, and molecules. We investigated a protocol to introduce our new approach for the induction of seroclearance by considering extracted data and also our unpublished data regarding the association between regulatory cytokines and CHB. The three main steps taken to prepare this study are briefly described below. Firstly, all relevant studies in electronic databases, including PubMed, Scopus, and Google Scholar, were searched for the latest information on the role of cellular and humoral responses in HBV infection. Secondly, the appropriate findings were extracted and discussed. Thirdly, we hypothesized that a novel approach could be employed to treat CHB patients. Additionally, we discussed the possible efficacy of this method, available approaches to make it practical, possible associated side effects, and management of candidate patients to reduce the associated risks. Both humoral and cellular immune responses are influenced by cytokines and also molecules on the cells’ surface. In order for naive CD4+ to differentiate into the different types of Th cells, it is essential that it receives appropriate signals from the antigen-presenting cells (APCs) or other sources of associated cytokines. In fact, during the early stage of infection, APCs stimulate the differentiation of naive CD4+ T cells into Th1 with IL-12 secretion, which is followed by IFN-γ production by differentiated T cells. HBV has also been demonstrated to induce IL-23 in APCs, which leads to Th17 differentiation (14). CD8+ T cells may also be activated in the presence of appropriate signals from the T cell receptor (TCR) as well as related cytokines (15). Although antigen-specific signals mediated by TCR have pivotal roles in the initiation of HBV-specific immune responses, co-stimulatory signals from APCs are also critical for T cell activation. In the absence of co-stimulatory signals, cell death of previously activated T cells can occur. CD28 and CD40 are the most well-discussed co-stimulatory molecules that bind to the B7 family (CD80 and CD86) and CD40L (CD154), respectively. The critical roles of CD40 and CD28 in CD8+ T cell responses during HBV infection were discussed previously (16, 17). In contrast to the discussed cytokines and co-stimulatory molecules, some opposite conditions may also be governed by Treg-related cytokines as well as co-inhibitory molecules. IL-10, IL-35, and transforming growth factor beta (TGF-β) are regulatory cytokines that could stimulate the differentiation of various types of Tregs. IL-10, IL-35, and TGF-β induce the differentiation of naïve CD4+ T cells into Tr1, iTr35, and Th3, respectively. These cytokines could also be involved in autocrine signaling that results in the promotion of the functions and stability of Tregs. Among these cytokines, IL-10 plays a pivotal role in viral persistence (18). Moreover, IL-35 was recently introduced as a potential therapeutic target in CHB (19). Although the serum level of TGF-β is increased in CHB patients, its role in the induction of Th17 and Tregs in CHB patients remains a controversial topic (20, 21). Tregs suppress vigorous T cells’ responses via cell-cell contact or via cytokine secretion. To function properly, Tregs require the expression of co-inhibitory molecules. Programmed death-1 (PD-1), T-cell immunoglobulin and mucin-domain containing-3 (TIM-3), and cytotoxic T lymphocyte antigen-4 (CTLA-4) are the most frequently discussed co-inhibitory receptors in HBV infection. These molecules have more important roles in CD8+ T cell function and survival compared to CD4+ T cells. Interestingly, the blockade of each of these molecules in CHB patients counteracts CD8+ T cell dysfunction or inhibition (22). In overall, it could be concluded that Tregs are dominant in CHB infected patients and suppress the response of effector T cells. This dominancy may result from the expression of co-inhibitory molecules, autocrine production of regulatory cytokines, and also the inhibition of co-stimulatory molecules. According to previous studies, it can be suggested that the inhibition of Treg promoting factors may reverse the impaired functions of CD8+ T cells and CD4+ T cells (23). Various types of immune cells are involved in immune responses during HBV infection; some of these cells are considered the main arm of the immune system, while others serve to amplify the main arms. Both humoral and cellular responses are critical players in HBV infection. However, the humoral response is essential to prevent viral spread within the host (24). In contrast, the cellular immune response acts through the clearance of infected cells via both cytotoxic and non-cytotoxic mechanisms. In HBV infection, CD8+ T cells, especially cytotoxic T lymphocytes (CTLs), are the most important players in viral clearance (25, 26). CD4+ T cells are another crucial part of the immune system that contributes to HBV infection. These cells offer antiviral effects via the secretion of different cytokines, including interferon-gamma (IFN-γ) and tumor necrosis factor alpha (TNF-α). Additionally, CD4+ T cells promote CD8+ T cells, which significantly increase the viral-clearance potential and also stimulate B cells to produce antibodies through Th2 secreted cytokines. Impairment of any of these cells may result in the induction of a tenuous immune response, which could be followed by the persistence of HBV. Involved immune cells are not limited to effector T cells alone. Indeed, Tregs, which may suppress the effector immune response, contribute to the impaired immune response in patients with CHB (27). Although the activation of Tregs is critical to remitting the majority of autoimmune diseases, it is believed that their activity is not favorable for viral clearance in CHB patients and is also considered to be a serious barrier to HBsAg clearance. Recently, Ye et al. (22) reviewed the exhaustion of T cells in CHB and concluded that during CHB, HBV-specific CD8+ T cells are significantly exhausted via different mechanisms, including an increase in viral replication, CD4+ loss, and regulatory cytokine production. However, in acute HBV patients, HBV-specific CD8+ and CD4+ cell responses were detected from incubation until recovery (28). Despite the comparable frequency of Tregs in acute HBV in healthy controls, a significant elevation in Treg populations in CHB patients was also reported (29, 30). Cytokines are the most important differentiation or inhibition factors of T cells. These proteins induce the differentiation or inhibition of T cells. Some cytokines, such as TGF-β, IL-10, and IL-35, act in an autocrine manner to induce Th3, Tr1, and iTr35, respectively. These inductions impair the functions of effector T cells. In contrast, other cytokines, such as IFN-γ, IL-6, and IL-23, enhance the antiviral capacity of T cells through the promotion of Th1 and Th17 cells. Several studies have confirmed elevated levels of regulatory cytokines in chronically infected HBV patients (20, 31-33), which could be explained by the over-population of Tregs or even regulatory B cells (Bregs). Although the elevation of effector T cell-related cytokines has been reported, the functions of these cells may be neutralized by Tregs (31, 34). Thus, because of the limited function of effector T cells due to the activity of regulatory cells, HBV could persist. Conversely, CHB patients benefit from increased levels of regulatory cytokines and cells. Indeed, regulatory responses minimize the incidence of liver injuries. A direct correlation of effector T cell-related cytokines with an exacerbation of liver injuries has been reported (34, 35). Surprisingly, IL-35 levels were also increased in patients with a higher viral load (32), which indicated the inhibition of effector T cell function followed by increased viral replication. However, no correlation between the serum levels of TGF-β in CHB patients with different viral loads has been reported (20). The role of regulatory cells in HBV infection is variable and depends upon the persistence status of HBV. In acute HBV infection, effector T cell responses are not significantly influenced by Treg responses. It has been reported that during acute HBV infection, the frequency of Tregs is comparable to that in healthy controls (29), which suggests that Tregs are not the main players. In contrast, effector T cell responses were elevated in the acute phase, which highlights their vital roles in acute HBV infection. If clearance occurs, Tregs remains unchanged, while if CHB is established, Tregs will increase dramatically and cause CD4+ T cell and CD8+ T cell dysfunction. This elevation in Tregs results in continued viral replication. If HBV replicates faster than the rate of viral clearance, detectable HBV DNA is expected; hepatitis B reactivation may occur with immune system reconstitution. We believe that this viral persistence in CHB depends on Treg overpopulation. In fact, effector T cells are inhibited via Tregs; viral replication may take place without any serious immune response. A significantly higher risk of CHB development in infants infected by their mothers could be explained by the higher frequency of Tregs and accompanying dysfunction of CD8+ and CD4+ T cells in newborns. Much evidence has implied the detection of higher frequencies of Tregs in preterm compared to term newborns (36); this finding supports the crucial role of Tregs in establishing CHB infection. Another study reported that HBsAg-positive newborns have a higher frequency of Tregs but not CD4+ and CD8+ T cells (37). However, a dysfunction of the CD8+ T cells due to a decrease in IFN-γ production was observed in HBsAg-positive newborns compared to healthy controls. In addition to Tregs, Gong et al. (38) demonstrated that IL-10-producing Bregs were greatly increased in CHB infection. Additionally, it was revealed that Bregs’ frequency and function are Tregs-independent and the depletion of Tregs in patients with CHB did not affect the frequency of Bregs or their function. The role of these cells in CHB infection was also discussed previously (39). The IL-10 produced by the Bregs may have two different effects on immune responses: promotion of Tr1 cells and inhibition of Th1 responses. This feature of IL-10 makes it an attractive target to induce HBV-specific immune responses. According to several reports, the reason for CHB development is associated with regulatory cells. Indeed, viral clearance via effector T cells was limited by Tregs. Additionally, Bregs cause an elevation of IL-10, which results in Tregs promotion as well as Th1 dysfunction. It seems that the inhibition of regulatory responses helps to initiate effective HBV-specific CD4+ and CD8+ T cells. Recently, it was hypothesized that the inhibition of regulatory cells (especially Tregs) could be considered a novel possible cure of CHB patients (13). The inhibition of Tregs may increase the function of effector T cells. Following an increase in the antiviral capacity of T cells, viral replication will be limited. Therefore, it is expected that the use of nucleos(t)ide analogues in combination with a Tregs blockade could significantly improve antiviral capacity in these patients. Additionally, we believe that it is possible to induce seroclearance with the inhibition of Tregs. There are various approaches that may limit the functions of Tregs, which leads to the restoration of the impaired functions of effector T cells. Although this process may limit HBV replication, liver damage often follows and should be prevented through prophylactic treatment. Since IL-10 is deeply involved in Tregs’ and Bregs’ promotions and functions, it could be an attractive target to impair regulatory functions. Moreover, a blockade of IL-10 activity may enhance Th1 cells’ associated responses. IL-35 is a novel regulatory cytokine that promotes a new identified Tregs, which is called iTr35 (40). Interestingly, iTr35 cells are phenotypically and functionally distinct from previously identified Tregs. These cells mediate the suppression of effector T cells in an IL-10- and TGF-β-independent manner. IL-35 also induces a new subset of Breg, which is called IL-35+ Breg (41). There is some discussion about targeting this cytokine in HBV patients (19). Similar to previously mentioned regulatory cytokines, TGF-β causes the promotion of Tregs. Regulatory responses and effector responses inhibit each other. For example, there is some evidence that IL-15 could induce the apoptosis of Tregs (42). Additionally, this cytokine plays a critical role in the generation and maintenance of CD8+ T cells (43, 44). Thus, IL-15 could be a possible effector T cell inducer and Tregs inhibitor in HBV patients. CTLA-4 is a negative regulator of effector T cell responses, which was identified as the best characterized T cell co-inhibitory molecule. Because of its critical role in the function of Tregs and also the suppression of effector T cell functions, several studies have introduced CTLA-4 as an attractive target in anticancer immunotherapy (45, 46). Considering that this molecule essentially halts the functions of effector T cells, a blockade of CTLA-4 must facilitate and maintain HBV-specific immune responses. Ipilimumab is the only FDA-approved monoclonal antibody recommended for use in metastatic melanoma. Tremelimumab is another monoclonal antibody that acts against CTLA-4, which has not been approved so far. Similar to CTLA-4, PD-1 is a critical factor in the functions of Tregs as well as in limiting effector T cell activities. During various inflammatory responses, the effector T cell responses are inhibited by PD-1 activity (47). Although the PD-1 pathway is essential to prevent autoimmunity, it may also serve an HBV persistence inducer in CHB patients. The PD-1 gene is expressed in the presence of T cell activation (48). Therefore, it could be speculated that in HBV infection, PD-1 is expressed only after the activation of HBV-specific immune responses and thereby induces tolerance. A significant elevation of PD-1 expression on the total CD8+ T cell number was reported; it has been suggested that PD-1 expression is correlated with T cell exhaustion during HBV infection (49, 50). Fisicaro et al. (51) reported that the blockade of PD-1/PD-L1 interaction in CHB patients increases CD8+ cell proliferation as well as IFN-γ production. In 2014, nivolumab and pembrolizumab were approved to target PD-1 via monoclonal antibodies in melanoma and non-small cell lung cancer. Pidilizumab is another PD-1 blocker monoclonal antibody, which is under clinical investigation (NCT01295827, NCT01953692, NCT01840579, and NCT02142738). These monoclonal antibodies may be useful for the inhibition of Tregs to suppress viral replication chronic HBV infected patients. There are several lines of evidence that TIM-3 can cause T cell dysfunction (52, 53). Thus, based on our previous discussions, TIM-3 is suspected to be involved in the impairment of T cell responses during CHB infection. The over-expression of TIM-3 during CHB infection has been reported in various types of immune cells, such as both Th cells and CTLs (54). In line with our discussion, it has been shown that TIM-3 blockade restored the impaired function of CD8+ T cells in a mouse model of HBV infection (55). Wu et al. (56) reported that the blockade of the TIM-3 pathway led to a significant improvement in both the proliferation and antiviral cytokine secretion of CD8+ T cells in patients with CHB. Currently, there is no approved monoclonal antibody to target the TIM-3 signaling pathway. Immune responses could be manipulated via different types of biological agents and even corticosteroids, which are widely used in treating various autoimmune diseases and different types of cancer. Multiple associated side effects have been reported either after or during biological therapies, and some of them were reviewed by Tavakolpour (57). Although different aspects of the side effects associated with the inhibition of regulatory cells remains unclear, some certain occurrences after the blockade of Treg responses can be expected. A balance between viral replication and clearance is initiated in most CHB patients, and any disruption could lead to hepatitis B reactivation; even the hepatitis B flare, the impairment or depletion of Tregs or the inhibition of regulatory cytokines could cause the activation of disease. Recently, Tavakolpour made a distinction between different forms of HBV activation (hepatitis B reactivation and flare) and also introduced certain biological agents to inhibit vigorous T cell responses in HBV flares (58). Both hepatitis B reactivation and flare are the results of disrupting the balance between viral replication and the host’s immune response. The inhibition of Tregs clearly induces this imbalance and may also cause liver damage due to the cytotoxic actions of effector T cells. The possible side effects of the manipulation of Tregs are not limited to the activation of the disease. In fact, Treg manipulation could initiate some conditions similar to autoimmune diseases. It is generally accepted that dysfunctions in both Bregs and Tregs contribute to the development of autoimmune diseases. Attenuated Tregs responses may also result in aberrant effector T cells response and the appearance of phenotypes similar to some types of autoimmune diseases. Because T cells are significantly more important players than B cells, it seems that the inhibition of Tregs has a better outcome and is even safer than the inhibition of both Tregs and Bregs. Figure 1 illustrates the T cells involved in HBV infection and also the outcomes of an increased in population of effector T cells or Tregs. 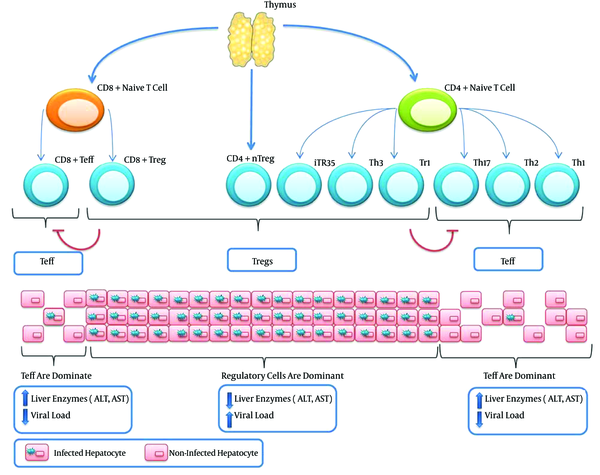 In addition to induced Tregs, there are also natural Tregs (nTregs), which originate from the thymus as CD4+ cells that express high levels of CD25. In conditions where Tregs are dominant (Tr1, Th3, iTr35, CD4+ nTregs, and CD8+ Tregs), the viral load will be increased, such as in chronic HBV. However, when a balance is present between viral replication and T cell responses, which is governed by Tregs, no serious liver injuries are observed. In contrast, when effector T cells (Teff) are dominant (Th1, Th2, Th17, and effector CD8+ T cells), the viral load will decrease due to the activity of Teff cells. Nevertheless, patients may experience serious liver injuries due to the cytotoxic actions of CD8+ T cells. Tregs and effector T cells could also inhibit each other. As previously discussed, patients with inhibited regulatory cells may experience different unwanted conditions, including the hepatitis B flare and the Initiation of autoimmunity. Therefore, patients must be managed to decrease any possibly associated side effects. Providing antiviral prophylaxis and also minimizing the viral load prior to the start of therapy should significantly reduce the risk of hepatitis B flare. Despite the disruption of the immune response and viral replication, prophylactic treatment limits viral replication, which reduces the severity of liver damage. Additionally, minimizing the viral load before initiating the inhibition of regulatory cells causes a mild cytotoxic activity of T cells. Both of these recommendations act by decreasing the degree of liver damage but cannot completely eliminate this effect. Thus, it should be emphasized that the risk of a HBV flare is still high. Several approaches have been suggested to control aberrant immune responses due to impaired regulatory functions. Firstly, the inhibition of both Tregs and Bregs significantly increases the risk of autoimmune disease development. Because of the critical role of T cells in HBV clearance, the inhibition of Tregs is a priority over Bregs inhibition. However, the exact mechanism of specific Tregs inhibition needs to be determined in further studies. A blockade of Tregs alone may still cause serious problems. Secondly, we believe that the depletion of Tregs leads to the immediate development of autoimmune disease. Moreover, inhibitions via lower capacity methods may not lead to the presence of enough effector T cells to clear the HBsAg. Thus, the optimum levels of Tregs and also the identification of suitable therapies for the optimum inhibition of Tregs should be discussed in further studies. A summary of the approaches, side effects, and management of patients with targeted regulatory responses that have been discussed are shown in Table 1. Under normal conditions, there is a balance between effector and regulatory cells. When this balance is disrupted, unwanted outcomes can occur. Dysfunction of regulatory cells, including T cells and B cells, should produce aberrant immune responses, which may result in autoimmunity. In these cases, patients should receive treatment that impairs effector cell responses via different approaches, including corticosteroid therapy and biological agents that inhibit T cell and B cell activation. The limiting of effector cells boosts regulatory cell function. In contrast, over-population of Tregs limits effector T cell functions, which reduces the virus-specific immune responses. In these situations, regulatory cells could be considered a double-edged sword. On one side, these cells prevent liver damage that could result from the cytotoxic mechanism of effector cells. On the other side, limiting effector T cells may lead to fast viral replication and long-lasting infections. B cells have a greater contribution to the prevention of viral spread within the host than they do for viral clearance. Thus, a lack of B cell functions or the depletion of these cells, which occur with the use of rituximab in several autoimmune diseases, could significantly increase the risk of hepatitis B reactivation (59). Although both T cells and B cells are involved in HBV infection, the clearance of the virus strongly depends on T cell activity. As discussed, inducing a proper balance between Tregs and effector T cells in CHB patients should increase the antiviral capacity of the host. However, this treatment carries the risk of disease activation. To reduce this risk, some considerations should be investigated. It could be concluded that the reason for disease activation after the inhibition of Tregs is because a high level of baseline HBV DNA is correlated with the risk of disease activation. Accordingly, it has been suggested that a Tregs blockade should be initiated in CHB patients with undetectable HBV DNA. The relatively mild cytotoxic activity of CTLs causes little damage in these cases compared to patients with a high level of baseline HBV DNA. Because of the continuous replication of HBV, the prevention of further viral DNA synthesis could significantly improve the chances of treatment success. Therefore, the initiation of antiviral therapy a few months prior to starting the Tregs blockade is recommended to reduce the risk of disease activation. Because serious liver injuries may result from the development of drug resistance, it is better to choose drugs with a high barrier to resistance, such as entecavir and tenofovir. Maintaining antiviral therapy after the cessation of immunotherapy is also suggested to minimize the risk of hepatitis B flare. Based upon the results of this study, the inhibition of Tregs was identified as a new weapon that may be used against the persistence of HBV in CHB patients. However, because of the risk of hepatitis B flare during or after the Tregs blockade, further studies that include animal models and clinical trials will be needed to clarify the efficacy and safety of this approach. Authors’ Contribution: Study concept and design, acquisition of data: Soheil Tavakolpour; analysis and interpretation of the data: Soheil Tavakolpour, Seyed Moayed Alavian and Shahnaz Sali ; drafting of the manuscript, critical revision of the manuscript for important intellectual content: Soheil Tavakolpour, Seyed Moayed Alavian; administrative, technical, and material support: Soheil Tavakolpour, Shahnaz Sali; study supervision: Seyed Moayed Alavian.